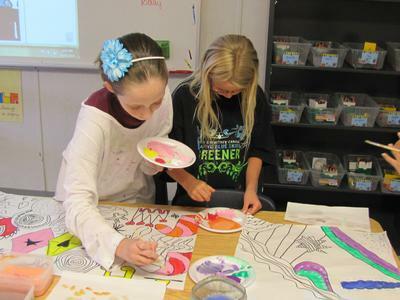 Not only does participating in the Arts allow our students the opportunity to shine, and enjoy their artistic ability, but studies show that arts can play a critical role in improving the academic performance of students. 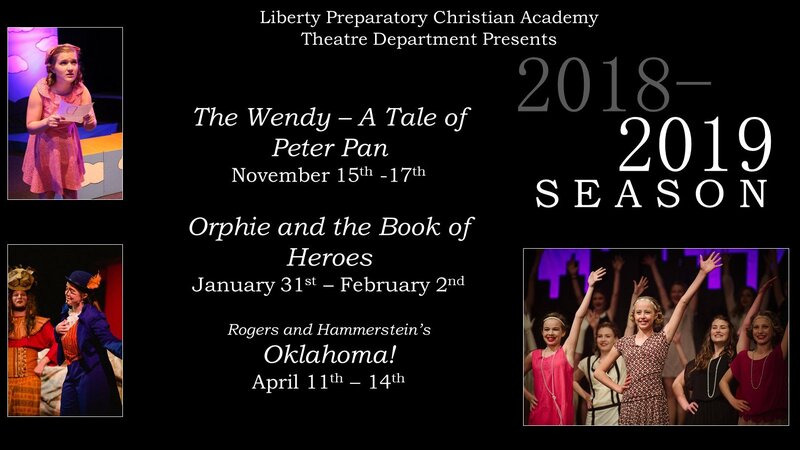 At Liberty Prep, we celebrate the arts and encourage our students to participate through many different ways. Create your profile using a username and password. If you have previously created one, just simply log in using your account information! Select your “cart” to proceed to checkout. Your tickets will be emailed directly to you. The Arts are important to us at Liberty Prep. God has given each of us talents that we want to showcase for His glory, whether that talent is singing, acting, sewing, costume design, set design, stage help, marketing, audio & visual, photography, or video, we can put that talent to good use! Our talented drama teacher, Miss Baynes, paved the way to an amazing beginning of our overall theater program. Liberty Prep’s first musical, Seussical Jr., in the spring of 2014, was a huge success! 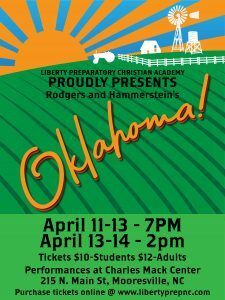 We will be continuing our program with a fall play and a spring musical each year., as well as several theater-based electives for middle and high school. In addition to these productions, we will also have an annual Christmas program, featuring music and skits from all grade levels, as well as our annual Talent Show, one of the most entertaining nights of the year! Ace Your Audition Masterclass – December 11th, 6-8pm. Come hone your audition technique and learn the ins and outs of what makes a successful audition! 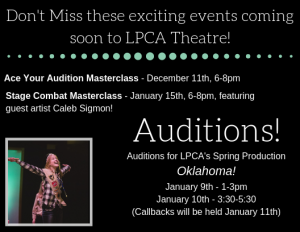 This course will focus on proper audition etiquette, how to effectively prepare for an audition, what material is appropriate, and will give students the tools to develop confidence prior to and in the audition room! Stage Combat Masterclass – January 15th, 6-8pm. Ever wonder how movie, television, and stage actors fight without getting hurt? Come to learn the tricks of the trade! Students will learn proper hand-to-hand combat techniques and how to safely and effectively execute a fight sequence! Featuring guest artist, Caleb Sigmon, this masterclass will be full of physical fun! Ensemble Music Masterclass – February 5th, 6-8pm. Do you love to sing? Maybe you’re interested in singing, but have been nervous to give it a try? This masterclass is for these and everyone in between! Come to learn skills in how to read music, hold a harmony, blending with a group, breath support, and so much more! Through this group voice lesson style masterclass, students will learn a full musical theatre piece, taught by guest artist, Cathy Banner!. Students can anticipate improving not only their individual vocal ability but also that of the group as a whole! Mastering Monologues Masterclass – March 12th, 6-8pm. How do you find a good monologue? What makes an actor effective when delivering a monologue? 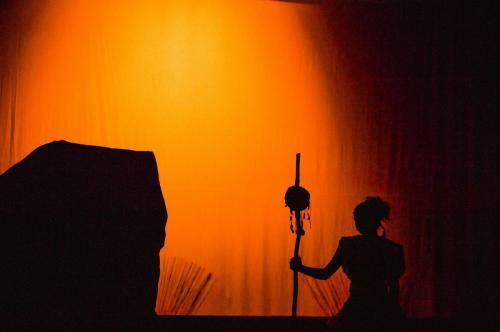 These and many other questions flood an actor when given or selecting a piece to perform. This masterclass will explore the correct techniques in delivering monologues and will give actors a sense of confidence when acting alone onstage! Students will receive individual feedback and coaching as well as will have a wonderful time increasing their acting abilities with the group! Click on an album to see images. Click on images for a full view. ​Directed by our fabulous art teacher, Mrs. Fisher, some of our students’ artwork is located in an Artsonia Gallery.